THE GOVERNMENT’S ACTION plan on jobs is “ticking all the boxes, bar one – creating jobs”, Sinn Féin deputy leader Mary Lou McDonald said yesterday. She made the comments at the MacGill Summer School in the Glenties, where she told attendees that unemployment had risen from 14.4 per cent in June 2011 to 14.9 per cent in June 2012. To be fair to the Government – they have already acknowledged this. In the same week as patting themselves on the back for achieving their own unambitious targets, they unveiled a €2.25 billion six year stimulus plan. McDonald said that there is “a deficit problem in this state that must be addressed”, and that there are a range of taxation and savings measures that can be used to do this. However she said that Sinn Féin “radically differ[s]” with the Government on what those measures should be, though “we all agree on the end game of deficit reduction”. Sinn Féin has always pointed out the need for growth and how a stimulus could kick-start this. This has been the over-riding theme of all our economic publications for the last four years and will be again in our jobs recovery programme to be published this September and our pre-budget submission later in the year. does have the capacity to introduce a substantial Government-led stimulus, supported by the private sector and backed up by other measures which do not require financial input but can make it easier for businesses, entrepreneurs, co-ops and state enterprises to create jobs. She said this has to be complemented by deficit reduction measures which do not deflate the domestic economy. 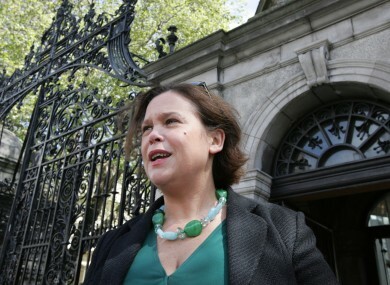 Email “Mary Lou McDonald: "Austerity will not cure the deficit"”. Feedback on “Mary Lou McDonald: "Austerity will not cure the deficit"”.